The color property describes the foreground color of an element. For example, imagine that we want all headlines in a document to be dark red. The headlines are all marked with the HTML element <h1>. The code below sets the color of <h1> elements to red. Colors can be entered as hexadecimal values as in the example above (#ff0000), or you can use the names of the colors ("red") or rgb-values (rgb(255,0,0)). The background-color property describes the background color of elements. The element <body> contains all the content of an HTML document. Thus, to change the background color of an entire page, the background-color property should be applied to the<body> element. You can also apply background colors to other elements including headlines and text. In the example below, different background colors are applied to <body> and <h1> elements. Notice that we applied two properties to <h1> by dividing them by a semicolon. The CSS property background-image is used to insert a background image. As an example of a background image, we use the butterfly below. You can download the image so you can use it on your own computer (right click the image and choose "save image as"), or you can use another image as you see fit. To insert the image of the butterfly as a background image for a web page, simply apply the background-image property to <body> and specify the location of the image. NB: Notice how we specified the location of the image as url("butterfly.gif"). This means that the image is located in the same folder as the style sheet. You can also refer to images in other folders using url("../images/butterfly.gif") or even on the Internet indicating the full address of the file: url("http://www.anyimagehostingsite.com/butterfly.gif"). In the example above, did you notice that by default the butterfly was repeated both horizontally and vertically to cover the entire screen? The property background-repeat controls this behaviour. The table below outlines the four different values for background-repeat. The property background-attachment specifies whether a background picture is fixed or scrolls along with the containing element. A fixed background image will not move with the text when a reader is scrolling the page, whereas an unlocked background image will scroll along with the text of the web page. The table below outlines the two different values for background-attachment. Click on the examples to see the difference between scroll and fixed. For example, the code below will fix the background image. By default, a background image will be positioned in the top left corner of the screen. The property background-position allows you to change this default and position the background image anywhere you like on the screen. There are numerous ways to set the values of background-position. However, all of them are formatted as a set of coordinates. For example, the value '100px 200px' positions the background image 100px from the left side and 200px from the top of the browser window. The table below gives some examples. 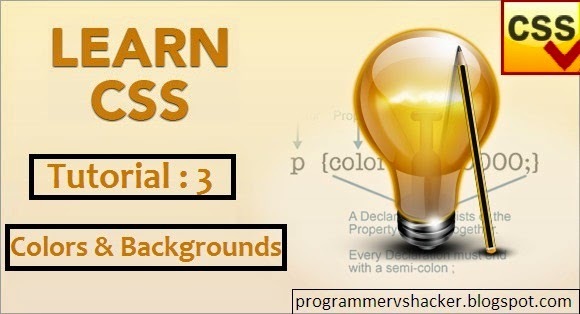 The property background is a short hand for all the background properties listed in this lesson. With background you can compress several properties and thereby write your style sheet in a shorter way which makes it easier to read. These two properties that are not specified would merely be set to their default values which as you know are scroll and top left. In this lesson, you have already learned new techniques that would not be possible using HTML. The fun continues in the next lesson which examines the broad range of possibilities when using CSS to describe fonts. Don't panic if you don't know how to write a definition essay for college, this is what will help you.